We extend our many thanks to our gracious host organizations Angel Flight West and Angel Flight South Central for their warm hospitality in bringing us AIR CARE 2013. The delegates from many Public Benefit Flying Groups enjoyed wonderful presentations, wonderful social events in Albuquerque, delicious meals, and a great conference. Thank you to our hosts, all the delegates, their groups, and the presenters for making Air Care 2013 so memorable and valuable! The following schedule is being retained here in the archives so site visitors can see what they missed or remember what they enjoyed. Each year the Air Care Alliance holds its AIR CARE national conference to bring together those most involved in public benefit flying. 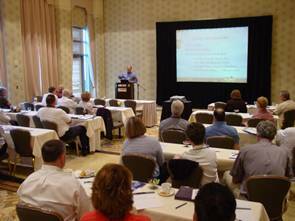 Attendees enjoy learning from, sharing knowledge with, and building relationships among their peers from across the country. Why attend? You will join other leaders and staff members of many public benefit flying groups who believe that we all benefit from the goodwill and mutual support gained from working together and learning from one another. And we have fun doing it! 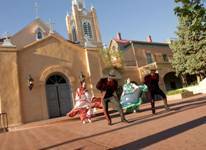 In addition to our informative conference in the magnificent Hotel Albuquerque you will experience the magic of Old Town Albuquerque and the enchantment of New Mexico. Visit http://www.albuquerqueoldtown.com to learn about Old Town! Of course you will also enjoy the camaraderie of your public benefit flying friends from across the country as we experience together the fun activities planned and the sessions that will deal with the issues you confront in providing leadership for your charitable aviation organization, as well as current aviation matters that impact your daily operations. • And - collaborated with the National Aeronautic Association to create the first ever National Public Benefit Flying Awards for volunteer pilot groups and volunteers. Air Care 2013 promises to be two great days with your charitable aviation friends and colleagues in magical Old Town Albuquerque, New Mexico! 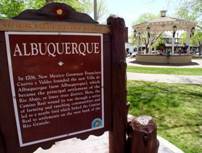 Visit http://www.albuquerqueoldtown.com to learn about Old Town! 6:30 Wine Tasting Dinner for early arrivers – St. Clair Winery (across street from hotel) www.stclairwinery.com/bistros/albuquerque/ Order from a tasty menu and pay separate checks. Although you may schedule this optional Walking History Tour of Old Town, remember that the rest of this day is wide open for you to enjoy the sights and sounds of one of the most fascinating cities in our country. Graciously hosted by Angel Flight West and Angel Flight South Central. Visit with your friends and colleagues from public benefit flying organizations from across the country. Then go out to dinner in one of the many exotic restaurants in Old Town Albuquerque, just steps from the hotel. Timothy Hale, Cabinet Secretary, New Mexico Department of Veterans Services, will welcome our group to The Land of Enchantment. Tim is a volunteer pilot, too! An update on the success of the Air Safety Project which created a high quality online course for volunteer pilots and VPO staff members. The course is a joint venture of the Air Care Alliance and the AOPA Foundation's Air Safety Institute..
A panel of veteran public benefit flying staff will share their thoughts on how to increase your volunteer pilot base, how to hang on to them, and how to tangibly give them the kudos due them. The staff of Angel Flight West will share and demonstrate their new and enhanced version of AFIDS (Angel Flight Information Database System), offering it at no cost to any charitable aviation organization. About 5 organizations are already utilizing it. Melissa Rudinger, AOPA's Senior Vice President of Government Affairs, will brief us on the latest aviation issues "inside the Beltway" and then then will be joined by Attorney and ACA Board Member Jeff Kahn of Angel Flight East for a discussion of current legal and legislative and regulatory issues. Subjects will include those which may have a bearing on our public benefit flying, among them fuel reimbursement issues, liability relief for volunteer pilots, and the work of the GA Caucus. This will be a “Fundraising Show and Tell” session, which will feature several personnel from various organizations sharing what’s working in fund development. The floor will also be open to all who wish to share their ideas. Bring 60 copies of any information for distribution. ACA Board Chairman Rol Murrow will facilitate a panel of individuals from organizations which have been involved in emergency and disaster response to share what they have learned, ensuring that all public benefit flying organizations can develop response plans and have their volunteers ready to help when crises occur. Election of ACA Board Members and the conducting of Air Care Alliance annual business. Hotel Albuquerque is an inexpensive 10-15 minute taxi ride from the Airport. No hotel shuttle is available. Many major airlines serve Albuquerque including Southwest Airlines. Trains: The AMTRAK station is just two miles from the hotel. > NOW - April 12 for our highly discounted block room rate. Our original block sold out so the hotel added rooms and extended the date. 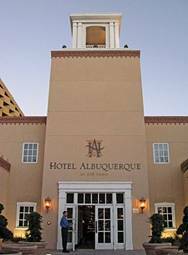 Hotel Albuquerque is a 15-minute drive from Albuquerque International Sunport Airport. Interstate 40 is within easy access, and taxi, limousine, and bus services are available. Conference Registration Fee $75 per person: Includes Friday welcome reception at the Hotel Albuquerque, Saturday conference with breakfast buffet, lunch & snack. All completed AIR CARE 2013 registrations forms and payments must be received by April 15, 2013 or a late registration price of $95 for the conference will apply. Send late registration forms via fax or email. "We all look forward to seeing you and your colleagues representing your public benefit flying group at Air Care 2013!"